This weekend, 2/4 & 5, @BFC: FCNL event, Green bags, Trustees, Sunday School, Worship! 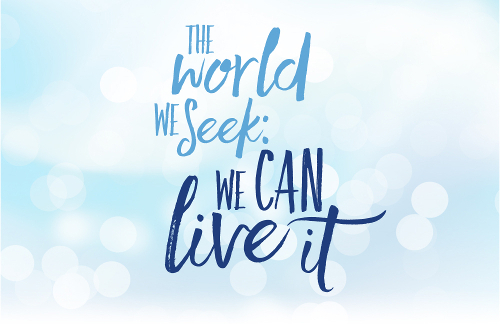 This Saturday, 2/4, please join us for The World We Seek: We Can Live It, a reception with Diane Randall, Executive Secretary of the Friends Committee on National Legislation. Diane will give updates on FCNL’s current priorities in Washington, vision for the future, and their new capital campaign. 4 to 6 PM; refreshments provided. Then on Sunday, 2/5, the Trustees gather to consider the care of our building and grounds at 9 AM. Then Sunday School for children and adults convenes at 10 AM. We gather for Worship at 11 AM, in song, prayer, silence, and a focused meditation on the story of Joseph and his brothers from Charles Blue.Fellowship time follows worship. And don’t forget that the Missionary, Outhreach and Christian Education Committee is meeting midweek–Thursday, 2/9, at 7 PM, beginning with a pizza dinner! Comments Off on This weekend, 2/4 & 5, @BFC: FCNL event, Green bags, Trustees, Sunday School, Worship!